Is Portal a puzzle game, a platformer or a shooter? The Escapist's genre wheel holds the answers. Genre is one of the simplest ways to describe a game, a kind of shorthand that lets gamers know whether they're likely to enjoy a game or not. Deciding which of the multitude of genres a particular game belongs to can sometimes tricky, but that's where The Escapist's genre wheel comes in. In Issue 283, The Escapist Editor-in-Chief Russ Pitts and Managing Editor Steve Butts outline the system that The Escapist staff devised to help determine a game's genre quickly and easily. 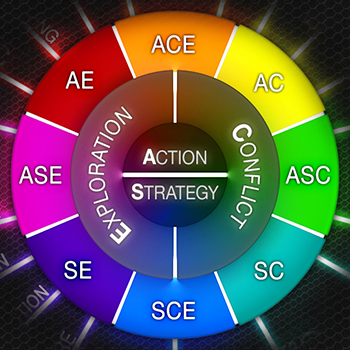 We started with what we believe to be the two main types of play: Action and Strategy. (If you subscribe to the theory that all games are wargames, then you could call these divisions "tactical" and "strategic.") What is the difference between Action and Strategy? ... Strategy games are large, cerebral, and academic. Action games are immediate, smaller in scale and more visceral. One is contemplative, the other reactionary. Utilizing these two divisions, we felt we could move forward and further classify the experience of play. Yet if every game is either an Action or a Strategy game at its core, then what to make of both types frequently featuring similar modes of play? Combat, or "Conflict" features prominently in strategy games, many of which are in fact wargames, but Conflict is also a prominent feature of many games that would be considered Action games. Conflict here merely means that the primary challenge in a game is presented by other similarly powered avatars. We contrast that with games of "Exploration," where the primary challenge is merely surviving or traversing the environment itself. Now the environment in this case may be defined as a physical space, as in a game like Sonic, or it may simply be a story, as in many adventure games. By combining and blending these four elements, you can create a broad spectrum that encompasses all types of games, as well as find games that you might not realize you'd enjoy. You can read more about it in "Introduing the Genre Wheel."